When I teach digital enhancements, I suggest to my students that the subject itself often recommends a certain special effect, filter or plug-in. For example, a grunge effect may look great on an image of an old car in a junkyard, but that same effect probably wouldn’t look so great on a beautiful landscape. When you photograph and process your images in the digital darkroom, try to "think like a painter" and "envision the end result," two more ideas I suggest to my students. I point out that painting is additive (the painter adds colors and textures on a canvas), while photography is subtractive (the photographer crops out, in-camera and in postproduction, elements that he or she doesn’t want in the frame). I started with an HDR sequence due to the scene’s high-contrast range. Here’s the HDR image, processed in Photomatix, from my 5-shot HDR sequence. It does capture a wide dynamic range, but it’s a rather flat shot. To me, it has no feeling, which is the most important element in a photograph. By adding special effects with plug-ins and filters, we’re subtracting some of the reality from a scene. When we subtract some of the reality, a photograph can look more creative and artistic—perhaps more painterly. 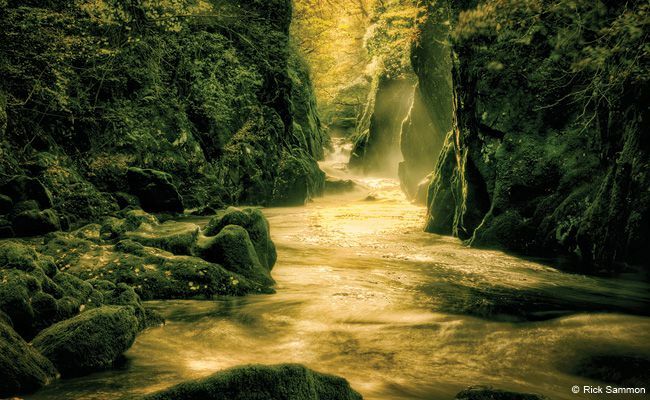 The opening fairy-tale-like image is the result of thinking like a painter and envisioning the end result while I was shooting in a magical place called Fairy Glen in the Conwy Valley, North Wales. Being in that spot was like being in a fairy tale. However, I knew that a straight shot, or even a standard HDR image, couldn’t capture or convey the feeling I had while I looked through my camera’s viewfinder. Here’s a screen grab of the Photomatix Pro window. Quick Photomatix tip: Work with the histogram displayed, so you can catch highlights that are washed out (spike on the right) or shadows that are blocked up (spike on the left). Here’s another Photomatix tip: Start with the White Point and Black Point sliders moved all the way to the left. Move the White Point slider to the right until the highlights are washed out and then move it back a bit. Then move the Black Point slider to the right until the shadows are blocked up and then move it back a bit until you can see into the shadows. The Lighting Adjustment lets you remove halos. Here, too, start with the slider moved to the left and move it to the right until the halos are gone.